When I tell you that this dish definitely satisfies my craving for macaroni and cheese, that’s a very big deal! 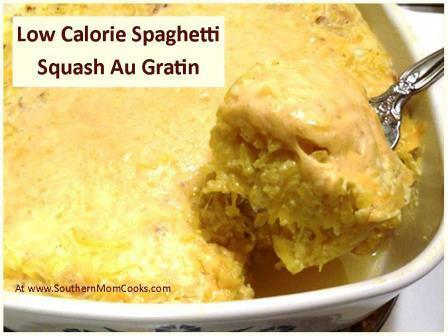 Served alongside a tender roasted pork tenderloin or some delicious chicken breast filets, Minnie’s Spaghetti Squash Au Gratin is a hearty full-flavored side dish that everyone in the family loves. 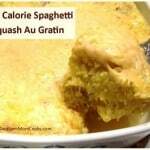 Served alongside a tender roasted pork tenderloin or some delicious chicken breast filets, this Spaghetti Squash Au Gratin is a hearty full-flavored side dish that everyone in the family loves. Cut the spaghetti squash in half and remove the seeds. Place halves face down on microwave-safe dish and cook on high for 8-10 minutes, or until tender throughout. Using two forks, scrape the insides of the squash and transfer to a small bowl. Combine sour cream, cottage cheese, salt, pepper, and half of the cheddar cheese in food processor and blend until smooth, scraping down sides as needed. Add sour cream mixture and EggBeaters to squash in bowl and mix well. Add additional seasonings if needed. Transfer the mixture to a buttered baking dish and top with the remaining cheddar cheese. Place into a 375º oven for 25-30 minutes, until firm throughout and golden brown on top. Allow to cool for 10-15 minutes before serving. Yummy!